Login to SURTEX 2016 Planner Now or Register for SURTEX 2016 Now. Let it Snow Snow Snow. 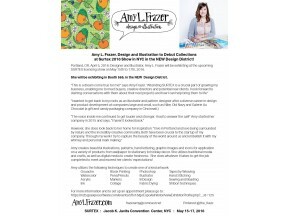 Amy L. Frazer, Booth 565.In the NEW Design District! Let it Snow Snow Snow! 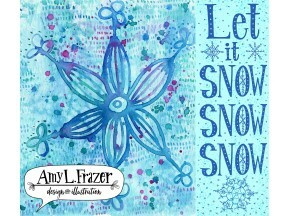 Beautifully illustrated snowflake and typography perfect for stationary! Can be put into a larger repeat pattern as well for wrapping paper! Mandarins!!! Booth 565! In the NEW Design District! Beautifully hand drawn mandarins layered with handdrawin gingham pattern usable across multiple product types from wallpaper to stationary! Garden Market. Amy L. Frazer, Booth 565. In the NEW Design District! 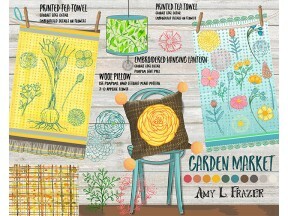 My Garden Market artwork applied to a variety of fabric products for the home. Artwork available for license. Can you see these patterns on your product? 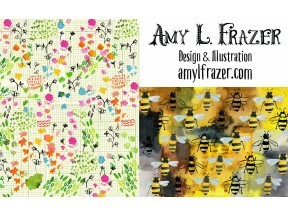 Flowers and Bees. Amy L. Frazer, Booth 565.In the NEW Design District! Artwork is a combination of watercolor backgrounds and handpainted motifs. Available for license. The Mountains Are Calling! Amy L. Frazer, Booth 565. In the NEW Design District! Intricate black line drawing with watercolor background placed behind. Also stunning as black and white only. 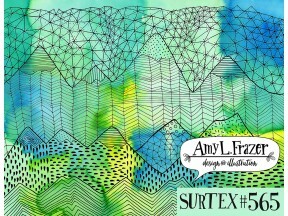 Amy L. Frazer to Debut Collections at Surtex. Booth 565 in the NEW Design District! Portland, OR. 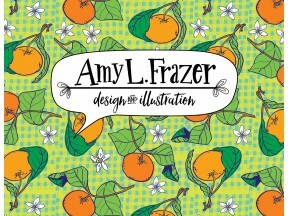 April 5, 2016: Designer and Illustrator, Amy L. Frazer will be exhibiting at the upcoming SURTEX licensing show on May 15th to 17th, 2016. Mandarins!! Florals! 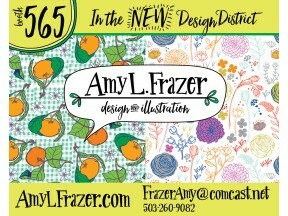 Amy L. Frazer Booth 565.In the NEW Design District! Repeat patterns of mandarin oranges and florals perfect for home / kitchen decor, apparel or wallpaper! Can you see these patterns on your product?